Piston rings do not seal 100%. As a result, pressurized gasses from the combustion process leak into the crankcase. This is known as "blow by" and a by-product of the modern internal combustion engine. Pressurizing the crankcase can lead to blown out crank seals, oil leaks, poor engine performance, etc. So these crankcase gasses are vented through the PCV system which recycles the gases back into the intake air stream to be burned. When the recycled PCV air combines with the fuel mixture, the effective octane rating of the combined fuel is lowered. The vented/recycled gasses contain oil vapor, water vapor and unburnt fuel, as shown below. This issue is further intensified with forced induction heat exchangers, such as intercoolers, which inherently provide ample surface area for cooling purposes. To prevent the sludge from reaching the intake system, a catch can is used as an in-line filter. When dirty crankcase gasses pass through the catch can, oil and other condensed material collects in the bottom. This oil would otherwise be digested by the engine's combustion process. What about the Radium Air/Oil Separator (AOS)? An air/oil separator works much like a catch can, the main difference being that the AOS allows the oil to be drained back to the engine. In order to allow the oil to drain back, the bottom port on the AOS must be connected to a compatible port on the crankcase or oil pan, in a way that gravity will allow the oil to flow into the engine. A key component of the AOS is the heated bottom plate. Engine coolant is plumbed to the AOS bottom plate in order to keep the AOS heated. This is critical in keeping water vapor from collecting in the AOS, as the goal is to only collect and return oil to the crankcase. An AOS system eliminates the PCV valve and associated connection to the intake manifold. The main benefit of the AOS system is the low maintenance. Because any oil collected is returned to the engine, it does not have to be emptied on a regular basis. A key component of the system shown above is the PCV valve. It opens and closes depending on the amount of vacuum (or pressure, if boosted) from the intake manifold. If the hose going to the PCV valve is not connected to the intake manifold, the PCV will not function properly. The PCV valve allows air to be drawn through the engine's crankcase, using the vacuum of the intake manifold to do so. The air enters through the crankcase vent side and then is sucked into the intake manifold. This helps draw out moisture from the crankcase. Shown below are catch cans installed on both the PCV line and crank vent line (dual catch can kit). 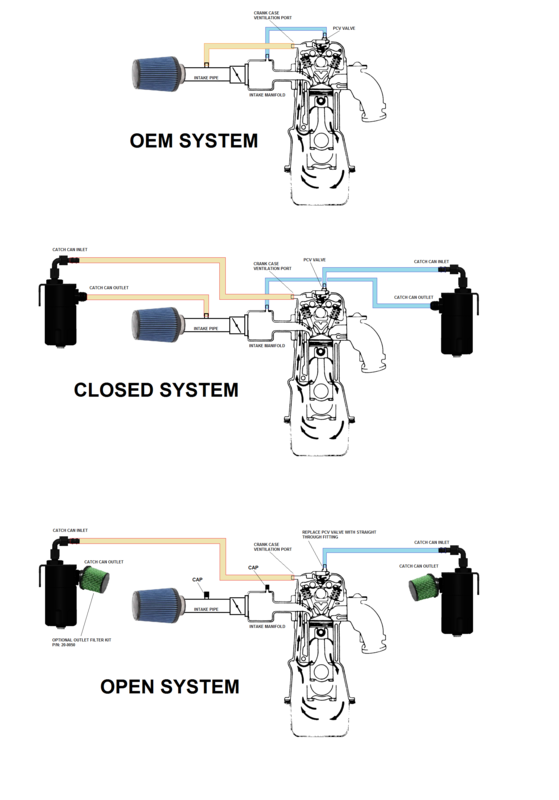 This is considered a "closed" system because all hoses route as they did in the OEM system (above). Nothing is being vented to atmosphere. This system replicates the function of the OEM system with the added benefit of oil separation accumulation in the catch cans. A closed system is great because no matter the manifold pressure, the PCV system is always promoting negative pressure in the crankcase via vacuum created by the intake manifold or the intake pipe. Furthermore, this setup remains emissions legal. 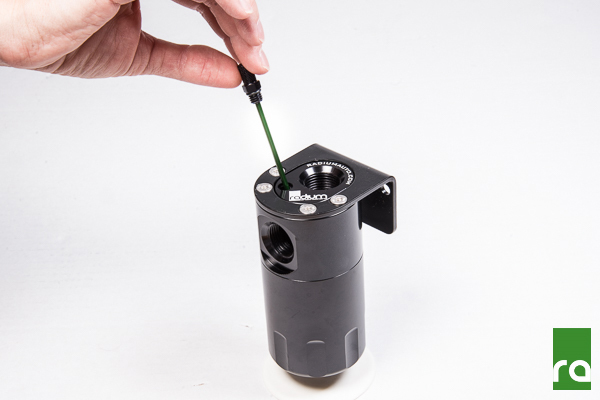 The Radium catch cans do not have a specific inlet or outlet port. Either the top or side port can be used for the inlet or outlet. For high performance vehicles that experience excessive blow-by, the primary goal is to let the crankcase "breathe" as much as possible when under high load/RPM. Generally, these applications include loosely built race engiens that spend a lot of time at full throttle/full boost. Also, emissions compliance is generally not a concern in these types of applications, with the catch cans vent to atmosphere. This system essentially creates two large, high-flowing ventilation points through which the crankcase can breathe. Radium Engineering offers optional breather filters that install on the outlet port of the catch can. They can be found HERE. Note: There may be "smells" coming from the catch cans and entering the engine bay. These "smells" can make their way into the fresh air intake of the HVAC system and can be noticeable inside the cabin. The Radium Engineering catch cans are equipped with a female threaded port on the bottom which could be used to allow draining of contents back into the engine. However, keep in mind, that the catch cans do not ONLY collect oil, they also collect condensed water and unburnt fuel. When these mix together in high temperatures, they form a nasty, foul-smelling "sludge" that you do not want back in the engine. 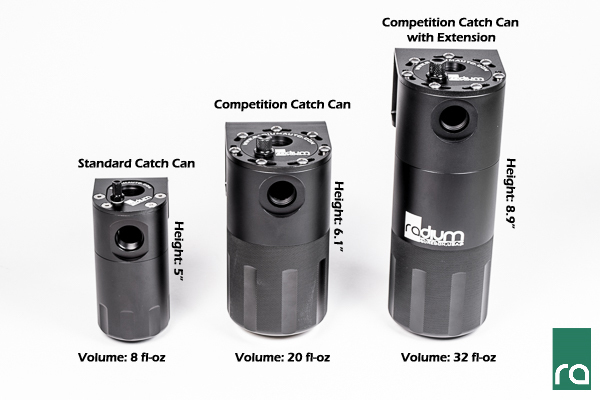 The Radium Engineering catch cans can be easily drained using a few different methods. A Radium Engineering Competition Catch Can shown in Michael Essa's FD championship winning E46 M3.